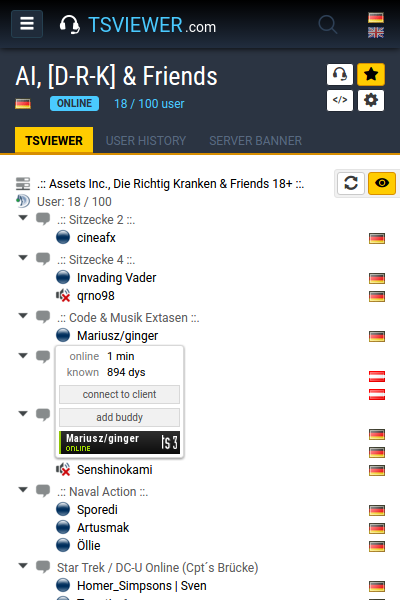 TSViewer.com is a TeamSpeak 3 Viewer and a TS3 Server database with additional features as for example Friends management, Server favorites, User Banners and the TSViewer site widget. Get an quick overview with this tour. Where is a friend at the moment? Where do i find an Server Admin? Which is the TS3 of my favorite gameserver? Find the server or the user with the search function. Search for the clan name, TS IP, homepage, gameserver, username, etc. Customize the TSViewer visually and integrate it easily into your site. There are the most important options available like Fonts, Font settings, colors, iconsets and other display details. This is a feature rather suited for server admins which shows the usage of the TS3 from the last week. Beyond that there is a timeline for the last 6 hours of used channels. This feature is only available if the user scan is enabled for an server. Dynamically generated pictures which show the server status. Just because it are pictures you can integrate them almost everywhere. As an forums signature, page extension, alternative for the TSViewer or something else. The registered servers are listed in various lists here. They are either categorized by countries or their purpose (mainly by games & game types). Find that way teammates from your country for a specific game. Dynamically generated pictures that display your TS3 status. You can choose from color templates or colorize them yourself. Anyone that clicks on your banner will be routed to your User Info, where from he can connect to you and add you as a buddy. Add your TS3 friends to your buddy list. See when they come online to get started together. You can connect to them from here to any (registered) server. Manage your favorite TS3 servers here. Get this way quickly to their TSViewers and connect to them. Your favorited servers will also be displayed in the site navigation on the left side. Frequently upcoming issues and questions are listed and answered in the FAQ (Frequently Asked Questions). That way you can fix this issues yourself (for example setting up TS3 permissions). If you have other TSViewer issues, just write me an email and i take a look at it.